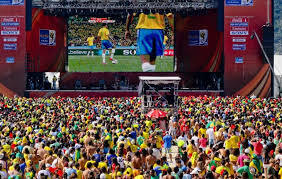 Twenty thousand people turned up for the 1st Fan Fest yesterday on the Beach in Fortaleza (Ceará). Fifa representatives, Ronaldo and the mascote were all up stage before the show started. The England team arrived in Rio (escorted by the army from the airport to their hotel) and manager Roy Hodgson had his first stroll on the beach having photographs taken with fans while the Germans got to their training camp in Bahia. 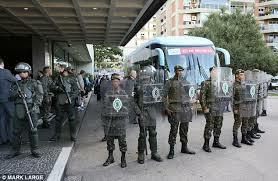 The Chile team trained in Belo Horizonte guarded by the army. Spain and Netherlands have also attracted the attention of the press as they will probably play the best match of the first phase against each other this Friday 13th. 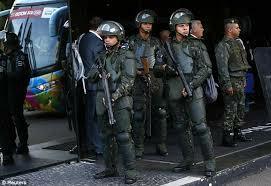 In São Paulo, there was a big rehearsal for the Opening Ceremony. According to newspaper reports, there will be canons and indians in canoes at the start, followed by baianas (native ladies from Bahia but traditionally dressed), all surrounded by dancers performing typical moves from all over the country and also capoeira. In the center of the pitch, there will be a very big lighting Globe, shooting different images throughout the stadium. At the end, people come in with footballs roped to their feet and the globe will show the Brazuza (the official world Cup Ball) together with the 24 flags from the participating countries. The last attraction (a surprise) will come out of the globe which will metamorphose itself into a stage. The ceremony starts at 15.30 Brazil’s time. 19.30 in England and 20.30 in Europe.